Hard training athletes consistently push their bodies to the limit. In order to develop the capabilities necessary to complete at a high level, athletes must balance the physical stress of training with appropriate recovery. If the body is not given the proper opportunity for rest and recuperation, one will not increase in strength or develop stamina from training. Without proper recovery, you might run the risk of physical and mental burnout from excessive training, along with increased odds of injury. As such, hot tubs should be included as an important component of a workout. Hot tubs serve as a great tool for promoting physical recovery from hard training. The warm water in a hot tub promotes recovery by allowing muscles to relax and circulate more blood through the tissue. This increases the delivery of vital nutrients that promote the recovery process. The massaging jets in hot tubs provide an additional benefit of manually loosening tight muscles. One can direct the strong streams of water at various body parts that are sore and stiff from training. This serves as a form of passive massage, warming and loosening the muscles. Loose, warm muscles are easier to stretch than tight, cold muscles. Hot tubs serve as an ideal preparation for a post-training stretching session. Beyond the numerous physical benefits, hot tubs will allow athletes with an opportunity to mentally unwind and relax from the psychological stress of training. 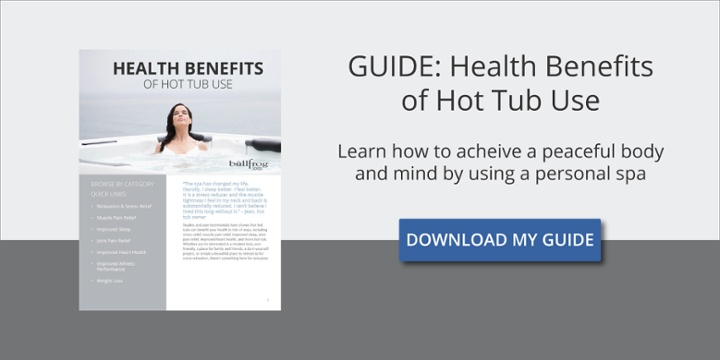 When placed in a quiet environment, hot tubs provide an ideal setting for one to meditate on a recently completed workout, review plans for future training, or visualize one’s performance in upcoming competition. On the other hand, hot tubs can also serve as an opportunity for individuals to bond with fellow team or community members after a tough training session or recreational game. It is often difficult to have a simple conversation with a teammate or training partner when trying to perfect a drill or run a wind sprint in the actual course of a practice. Athletes who use hot tubs together during post-practice recovery sessions will have the opportunity to develop stronger bonds and a deeper understanding of their teammates through frequent conversation. These bonds often promote better communication and a higher level of competition performance for team sport athletes. Athletes training for individual-level competition, such as swimming or track and field, can still benefit through more meaningful relationships with their training partners.